These users had en-GB configured for the msExchUserCulture attribute. As only the default en-US and en-AU language packs were deployed, Unified Messaging was falling back to defaults when the region was incorrectly configured. One explanation as to why this was the case could be a user signing into Outlook Web App for the first time, and selecting the wrong region (thanks Dan). Small issue, simple fix, but interesting none the less. 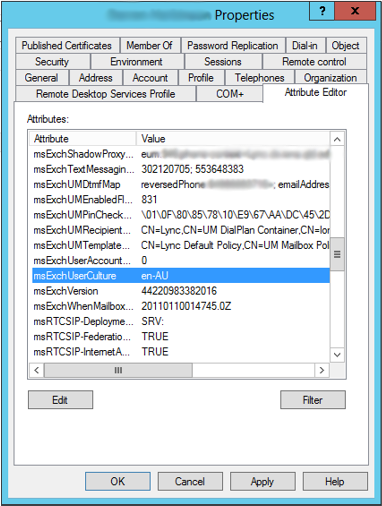 This entry was posted in Lync 2013 and tagged Exchange UM, Exchange Unified Messaging, Language Pack, Lync, Unified Messaging, Voicemail, Voicemail Prompt. Bookmark the permalink. Pretty cool, and a nice little window for someone who has absolutely no idea really of the technicalities of what his best mate does. From a linguistic perspective one can understand why users make the mistake. Quite often GB is the only alternative to US spelling option afforded in setup / select language scenarios. I would be interested to know, now the issue is identified, what the process is for developing and deploying the fix to avoid having to manually change each time the error occurs. Excellent question Dave, and I appreciate you keeping me on my toes! I say partly answer your question because this will only identify users that are incorrectly configured. A little more work required from my end to take the output from above and feed into another PowerShell cmdlet that sets msExchUserCulture to the correct regional setting.